Robert Patterson, the son of Robert Patterson and Jane Walkers, was born on May 30, 1743, on a lease-held farm near Hillsborough, County Down, Ireland. His family was respectable, though not affluent. Patterson attended school at an early age and soon became distinguished for his love of learning. He excelled in mathematics, but his family could not afford to pay for a university education. In 1759, when the French invaded Ireland, Patterson enlisted in the militia, and after serving for a year, rose to the rank of sergeant. He devoted himself to his military exercises, and soon became distinguished enough for his skill and good conduct to attract the attention of the officers of a British regiment stationed near Hillsborough, who offered him a commission in the regular army. Patterson refused this commission, choosing instead to return home to work on the family farm. In October of 1768, determined to try his fortune in America, Patterson embarked for Philadelphia, arriving there almost penniless. After spending a week in Philadelphia, Patterson set out on foot for Bucks County in order to seek employment as a schoolmaster. He was immediately hired at a school in Buckingham. Although Patterson had a natural talent for teaching, he decided to make more use of his mathematical talents, especially his knowledge of determining longitude through the use of lunar observations, and moved back to Philadelphia to teach navigation. One of his first strong students was Andrew Ellicott, who later became a well-known surveyor of the original boundaries of the District of Columbia. In 1771, Patterson’s parents, two of his brothers, and two of his sisters, immigrated to America, attracted by Patterson’s success and encouraging accounts. In 1772, with his finances vastly improved, Patterson was persuaded by a friend to invest his money in merchandise and open a country store in New Jersey. However, since he was unsuccessful as a shopkeeper, he was happy to accept a position as principal of the Wilmington Academy in Delaware in 1774. At the outbreak of the Revolutionary War, his duties as principal were suspended due to the fact that many of the students at the Wilmington Academy were called home. After removing his family to a small farm near Roadstown, New Jersey, Patterson enlisted as a military instructor in the Delaware militia, then under the command of Colonel John Haslet. He later served under Colonel David Hall, first in the medical corps and then as a brigade major. He remained in the militia until the British army evacuated Philadelphia and New Jersey in 1778, when his brigade was disbanded. In 1779, after the College and Academy of Philadelphia were reorganized into the University of the State of Pennsylvania, Patterson successfully applied to John Ewing, the provost, for employment as professor of mathematics. Patterson was professor of mathematics from 1779 to 1810, professor of natural philosophy and mathematics from 1810 to 1813, and vice provost from 1810 to 1813. Because he performed his official duties with integrity, industry, and ability, also rendering essential services to the University, he was granted an honorary Master of Arts in 1788 and an honorary Doctor of Laws in 1819. 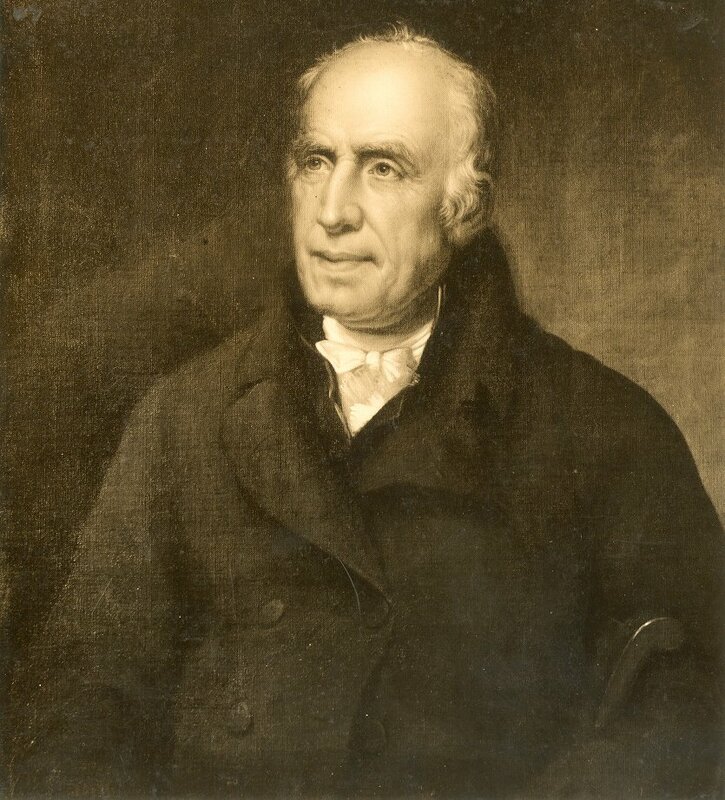 After presenting his resignation in 1814, Patterson was succeeded as professor of mathematics as well as vice provost by his son, Robert M. Patterson. Patterson resided at nine different locations in Philadelphia, beginning at 148 South Fourth and ending at 285 Chestnut Street. It was said that he only remembered the latter address because the second digit was the cube of the first and the third was the mean of the first two. In 1783, Patterson was elected to the American Philosophical Society, and was an active member for many years. He became the society’s secretary in 1784, its vice president in 1799, and its president in 1819, succeeding Benjamin Franklin, David Rittenhouse, Thomas Jefferson, and Caspar Wistar in this last position. Patterson was also one of five members of the American Philosophical Society chosen by Jefferson to assist and instruct Meriwether Lewis and William Clark in preparation for their expedition into the Pacific Northwest. Patterson corresponded often with Jefferson, who, in 1805, appointed him to the directorship of the United States Mint, a position he held until his death. Patterson was also a member of the Select Council of Philadelphia and served as its president in 1799. Just before his death, he helped found the Franklin Institute of Philadelphia, and served as the first chairman of its board of managers. Patterson contributed several papers to the Transactions of the American Philosophical Society, and was a frequent contributor of problems and solutions to mathematical journals. In 1806, he published a revised edition of James Ferguson’s Lectures on Select Subjects in Mechanics, in 1808, a revised edition of John Webster’s Elements of Natural Philosophy, and in 1809, a revised edition of Ferguson’s Astronomy. In 1808, Patterson wrote a short treatise consisting of six lectures on natural phenomena for the nonscientist entitled Newton’s System of Philosophy. His 1818 A Treatise of Practical Arithmetic contained extracts from his mathematical lecture notes at the University, but proved too difficult for beginners to grasp. Patterson devoted his life to the exact sciences and practical applications of mathematics. He died on July 22, 1824, in Philadelphia. He was married to Amy Hunter Ewing, daughter of Maskell Ewing, Esq., of Greenwich, Cumberland County, New Jersey, with whom he had eight children.